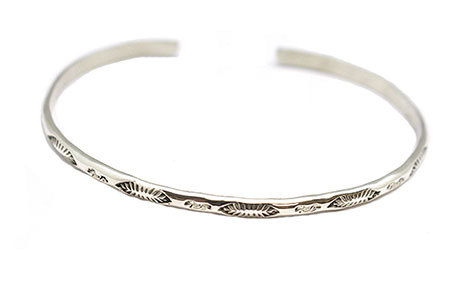 This sterling silver, light weight, mens size bracelet is made with #8 half round wire with assosrted native design stampings. It measures approximately 1/8" wide. They are Navajo hand made by Ida McCrae. Available in size 6, 6 1/4 or 6 1/2" with a 1" opening. They are slightly adjustable.